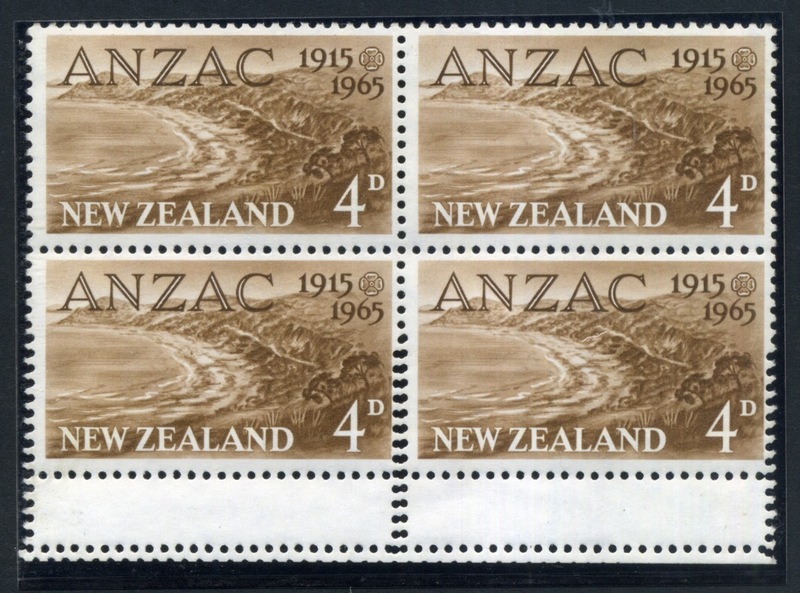 Virtual New Zealand Stamps: 1936 - 1965 - Early ANZAC Issues. On the 25th of April, 1915, New Zealand troops saw action for the first time in World War I. The aim of the campaign was to capture Constantinople (now Istanbul). The goal was to eliminated both of Germany's Balkan allies (Turkey and Bulgaria) from the war, and relieved the Russians from the heavy German pressure they were facing. The poorly planned landing went wrong from the start. Instead of landing on the chosen beach the Australian and New Zealanders landed further north on a narrow beach surrounded by steep hills. For six months they held this beach, making little headway inland against fierce resistance from the Turkish soldiers. Finally the decision had to be made to pull the troops back off the beach. This heroic but disastrous campaign left 2,721 New Zealanders dead and 4,752 wounded which was a big hit for such a small country. Over the years much criticism has been made of the British leaders who planned this attack. It would eventually lead to the New Zealand and Australian military becoming more independent from Britain. 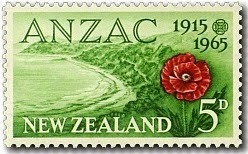 The campaign became a symbol of New Zealand (and Australia's) war losses. The 25th of April is observed in both countries as ANZAC Day - to remember those countries men and women whose lives were lost in war. 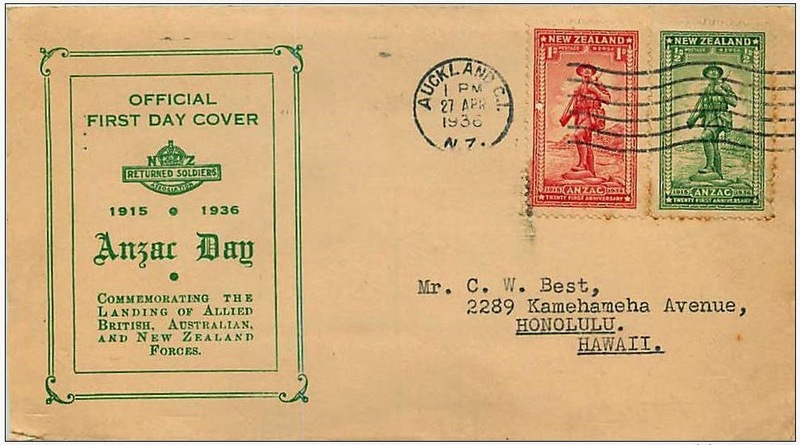 'ANZAC' is an acronym made up of the initials of the 'Australian and New Zealand Army Corps'. 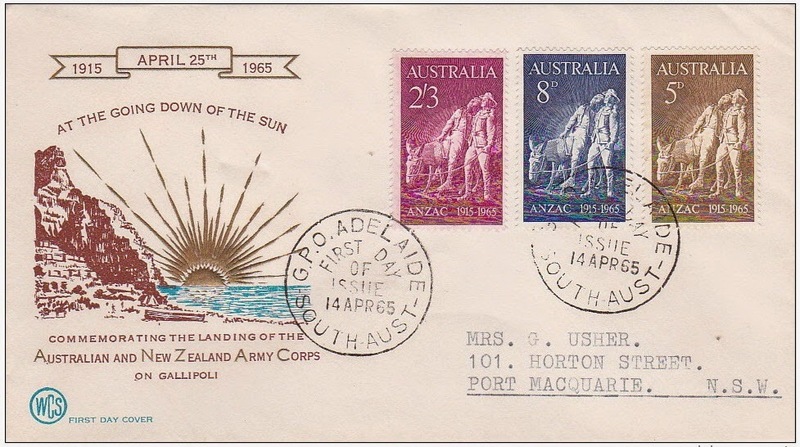 This stamp issue commemorated the twenty first anniversary of the landing on the Gallipoli Peninsula of the Australian and New Zealand Army Corps on 25 April 1915. 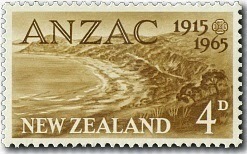 See our ANZAC Military Collection. 1d - ANZAC Red. ½d - ANZAC Green. 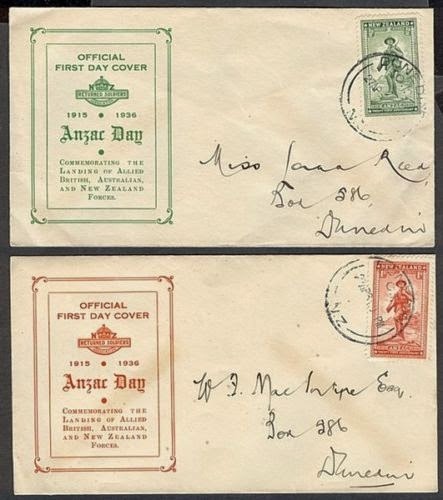 A printed cover was produced in either Red or Green, matching the colours of the stamps themselves. 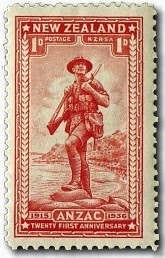 I have included three examples showing both stamps and one of each stamp. 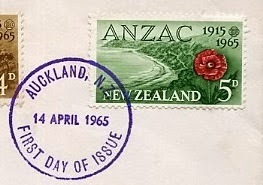 In 1958 the New Zealand Returned Services Association suggested that the fiftieth anniversary be recognised by another special issue. 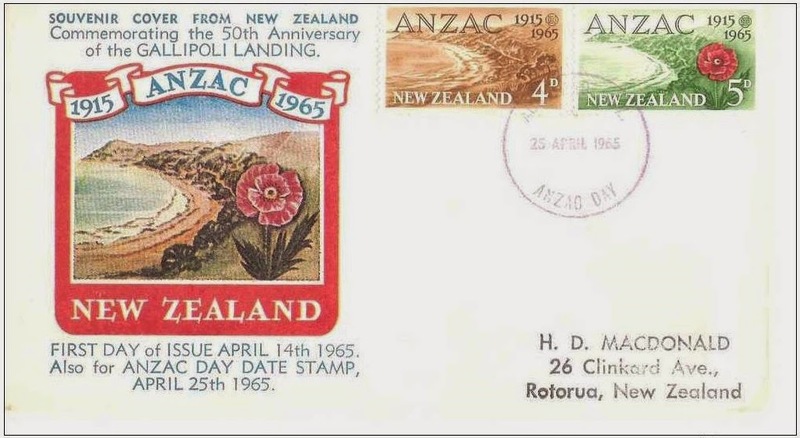 The final design was created by one of the more famous designers of New Zealand stamps, R M Conly of Christchurch. 4d - ANZAC Cove. 5d - ANZAC Cove & Poppy. with the addition of a red poppy. The poppy was included to commemorate the later service of the Corps in France and Belgium. 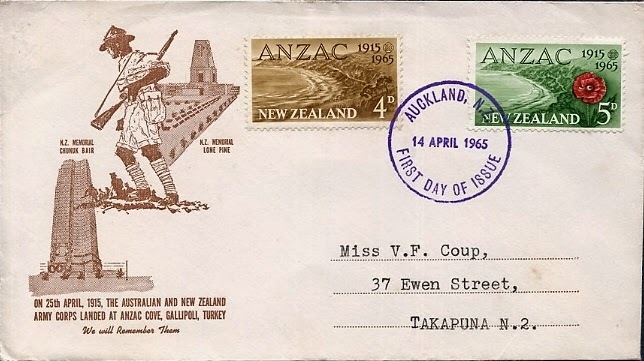 First Day Cover, dated 14th April, 1965. What is interesting about this cover is that it was designed for two different date. stamps. It was advertised that these covers had be received by 22nd April. double perforation between the two bottom stamps. can be see more clearly on the cropped image below. 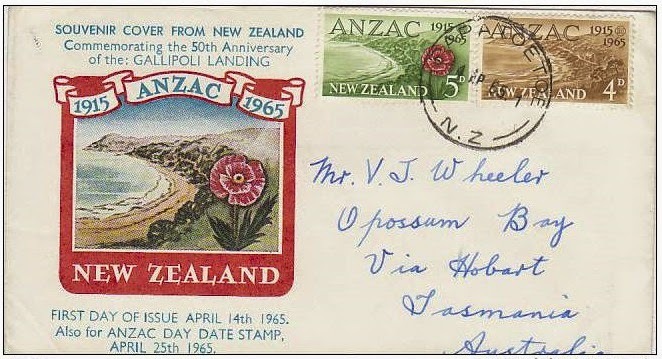 The First Day Cover issued by Australia on 14th April, 1965. The stamps show a drawing from a sculpture of Simpson and his donkey.